Ioane Naivalurua’s CRW Unit stormed Parliament in 2000 and later mutinied at the QEB Barracks to kill dictator Frank Bainimarama who escaped dressed up as a ‘marama’ – woman! If anyone has blood on his hands, it is the new police commissioner Ioane Naivalurua, a deeply malleable character. He had set up the Counter Revolutionary Warfare Unit with Major Ilisoni Ligairi for the father of the coup culture, Sitiveni Rabuka and was “a Rabuka Man” once. The CRWU, shorthand for the First Meridian Squadron, the unit's formal name, was disbanded in 2000, and was the brainchild of Rabuka. The Unit was involved in George Speight’s 2000 coup, the munity at the QEH Barracks, and was accused for attempting to assassinate the dictator Bainimarama in the failed mutiny. Although Rabuka was credited with the establishment of the CRWU, Major Ilisoni Ligairi, the former SAS officer, was the founding father. Naivalurua was part of the team which had a hand in the formation of the CRWU, a fact hardly known outside the QEH barracks. 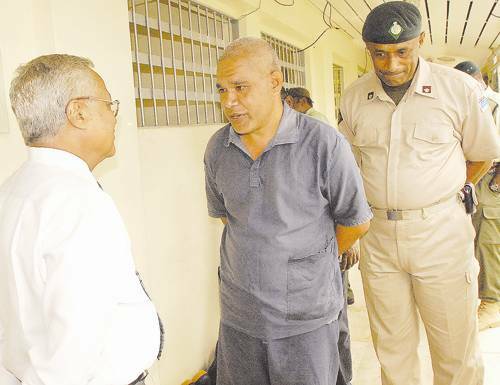 Coupfourpointifve can reveal that one of the reasons Naivalurua asked to become Prisons Commissioner after the 2006 coup was to ensure that George Speight, Jo Nata and others convicted for the failed coup kept their mouths shut! After all, it was CRWU, a handmaiden of Naivalurua, which brought so much death and destruction to Fiji. He is now policing the police, instead of sharing a cell with other CRWU mutineers, who attempted to kill the dictator in that failed mutiny at the QEH barracks. I prefer the term improver rather than dictator. For you guys fail to mention how composed the nation is under his leadership. You may not agree with everthing he has done but you can agree on this fact the corruption that permeated all sectors of government needed remedial work most expeditiously. coup four point five you are full of negetivity. ummmm!! !someone got carried away with his soft spoken ways and attitudes, make him angry...he will bite your backsite. Where's the $200m in freshly printed $20 notes gone? Was Khaiyum's Swiss visit mere coincidence? Why the sudden media blackout on this matter? You mean corruption like the slimy dictator bainimarama paying himeself $200,000 'holiday pay'? The only way Ioane can save himself from the International Court that will put the murdering coup pepretrators on trial will be to remove the dictator. And he'd need his missing testicles for that!! Tis all pittance compared to the havoc wreaked by the likes of Qarase and Rabuka. Besides most of what gets disseminated is mendacious and suppositional. Dont believe every thing you read. All you need to know is Bainimarama is doing all he can to secure your grand childrens future. That is a frightening thought ! Frank in drag I mean ! Lots of people still don't understand primary fuction of the CRWU. Full name offers explain? Somebody staged a coup - they responded. Unlike current rabble - these people should be commended & respected for valiant dedication. Well, to whoever posted this blog, i think jealousy or stupidity or say what the hell is your problem. How do do you know this is for a fact. How do you know he was there during the coup when actually he was in Iraq. He once led the CRW, but way before this coup even eventuated. we commend his hard work and dedication in moving this country forward and the Gorv for eradicating corruption. People like you who post this blog, are causing instability. oh and for your info..we know the facts.